Explanation: These detailed Hubble Space Telescope close-ups feature Jupiter's ancient swirling storm system known as the Great Red Spot. They also follow the progress of two newer storm systems that have grown to take on a similar reddish hue: the smaller "Red Spot Jr." (bottom), and smaller still, a "baby red spot". 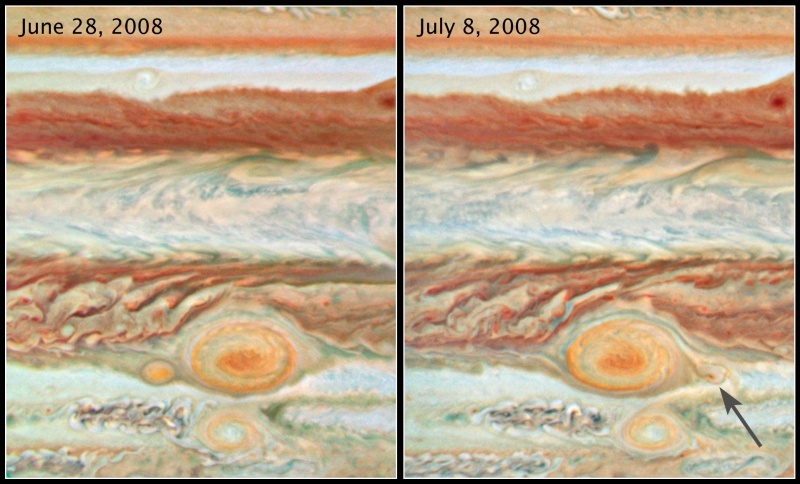 Red Spot Jr. was seen to form in 2006, while the smaller spot was just identified earlier this year. For scale, the Great Red Spot has almost twice the diameter of planet Earth. Moving horizontally from left to right past the Great Red Spot, Red Spot Jr. clearly went below the larger storm, but the smaller spot was pulled in. Emerging on the right, the baby spot's stretched and now paler shape is indicated by the arrow in the frame from July 8. It is expected that the baby red spot will be pulled back and merge, becoming part of the giant storm system.